On the 15th anniversary of the Sept. 11 attacks, headlines about the health of the Democratic presidential nominee rose to the top of the charts quicker than you could say "Never forget." While the memorial event she was attending at Ground Zero was quickly overshadowed, many stopped to ask how hot was it in New York when Hillary Clinton felt sick? A spokesperson for Clinton said she left the ceremony and went to her daughter's nearby apartment because she felt overheated. 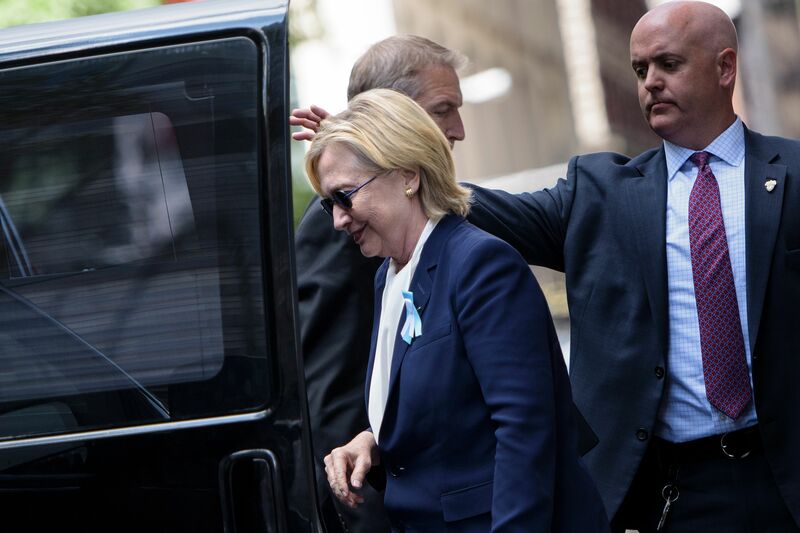 Certainly, video of Clinton leaving the event seems to show her struggling to get into the van, and it's not wrong to be concerned (if, you know, you're actually concerned) about a presidential candidate's health. But because this is the world we live in, people immediately began espousing conspiracy theories over a "hidden illness" because it was reportedly only around 80 degrees in New York when Clinton felt ill. According to AccuWeather, the high in New York City on Sunday was 83 degrees. Time and Date, which reports the temperature each hour, indicated that between 8 a.m. to 10 a.m. (Clinton was at the event from 8 a.m. to 9:30 a.m.), it was about 79 degrees. So, not as hot as you'd think when you hear of someone overheating. But is that honestly the biggest thing to be arguing about on a day that should be spent remembering the 15th anniversary of one of the worst attacks in American history? Instead of focusing on Clinton's overheating incident, everyone could be supporting the policies to help victims and survivors of 9/11. The James Zadroga Act was on the chopping block this year, and though it was renewed, it'll be up for debate again in 2020. The act provides health care support for survivors and first responders, as well as provides a home for the Victim Compensation Fund, and those really seem like a no brainer, right? But the act needs a lot of help to keep going. Instead of focusing on Clinton's overheating incident, everyone could pay attention to the actual service she was attending and put the same time into remembering those whose lives were lost in a terrible tragedy that some are putting into unhelpful and offensive theories about Clinton's health. Whether it was 80 degrees or hotter or colder, whatever, just remember — those who are spending more energy on the anniversary of Sept. 11 talking about how hot it was in New York instead of helping survivors or remembering victims are likely the ones who don't have Americans' best interests at heart.